I just finished reading the most AMAZING ebook about Pinteresting Strategies. And that’s actually the title so there you go. 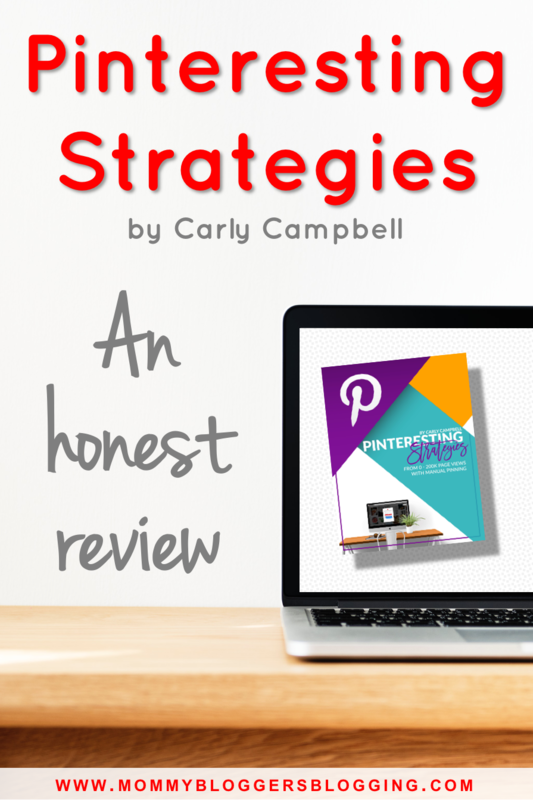 Pinteresting Strategies by Carly Campbell. Like I said I JUST finished reading it when I started to type this out. Literally put down my computer when I read the last word, picked up my phone and opened a new Evernote to start righting this review. So I haven’t tried implementing Carly’s advice yet, but I’ll update this post after I start seeing Pinterest success (see the update below! Spoiler: IT WORKS). That said, here is my review of the book! Since I started blogging, almost four years ago, I’ve been so overwhelmed with Pinterest (and promoting in general really). Honestly I think it’s one of the biggest reasons I’ve held myself back from being a profitable blogger. Pinteresting Strategies has really opened my eyes. I can’t wait to start manual pinning using her methods but I had to tell the world about it first! UPDATE: I tested out Carly’s methods and IT WORKS. Holy cow. It works. Anyway, back to my review! *DISCLAIMER* This post contains affiliate links. You can read more on my Disclosure Page. 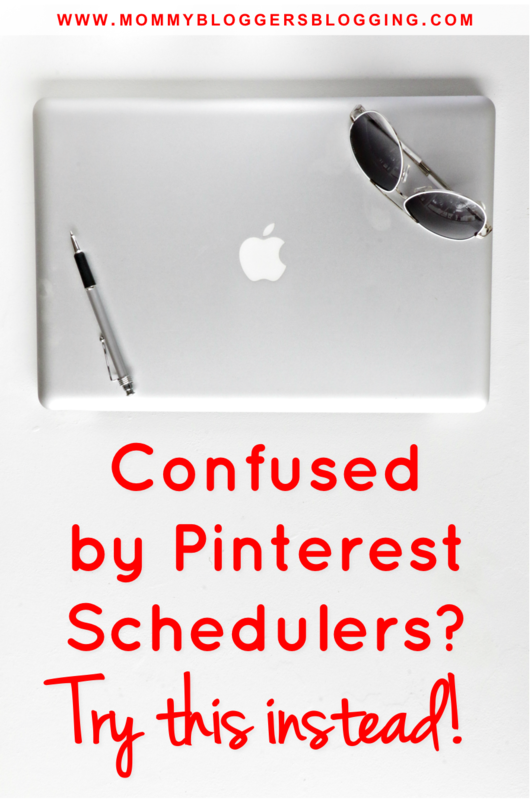 I was deterred from Pinterest to promote my blogs because all the big bloggers swear by scheduling pins. The cost if schedulers was pretty unrealistic for me, as blogger who was only making pennies so far. In addition to the cost, the act of scheduling itself seems super confusing. Earlier today, I decided to search “manual pinning” on Pinterest (just like you might have when you found my post). I read a few different blog posts and they all led back to this ebook, Pinteresting Strategies. I bought the book. It’s almost 11 pm. I had 8 pages left of the book when I stopped put my baby to bed. I had to get right back up after he was down. It was a long day but I’m so alert with the excitement of discovering this new strategy. Suddenly it all makes sense. Manually pinning makes sense. Carly also explains the way Pinterest works and how to use google analytics in your pinning. Her methods are totally genius and extremely doable for a mom blogger like me. Its not necessarily easy, but it’s a whole lot easier and makes way more sense to me than scheduling. I wanted to write this while it’s fresh in my head. I have to go to bed now though. I cannot wait to start this amazing Pinteresting Strategy tomorrow. I am so excited to finally get the traffic to my blog that I’ve been waiting for. I hope this review was helpful. I diligently pinned all of my pins manually for about two months (mid November – mid January). I had a couple little jumps in traffic a few weeks into the strategy. It was so motivating! That tapered back down and I got discouraged but I wanted to give manual pinning a solid try so I kept going. 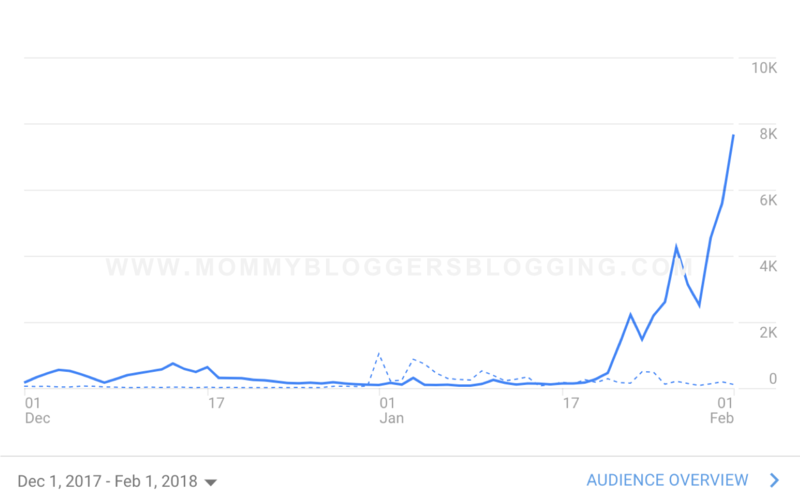 About a month and a half in to using Pinteresting Strategies, my traffic TOOK OFF. You can see in the screenshot below. It just climbed. That’s right, that peek is at almost 8,000 page views IN ONE DAY and I barely had a hundred a day when I started. It was going so well! I skipped a couple days because of circumstances beyond my control (life, right?). My traffic took a dip, but I started pinning diligently again and it went back up. Next I got curious. If I stopped pinning completely, how fast would the traffic fall? You can see in the screenshot below that it steadily fell. It would spike again but not nearly as high as it was when I was pinning every single day. There are advantages and disadvantages to every blogging strategy (and everything in life, really). 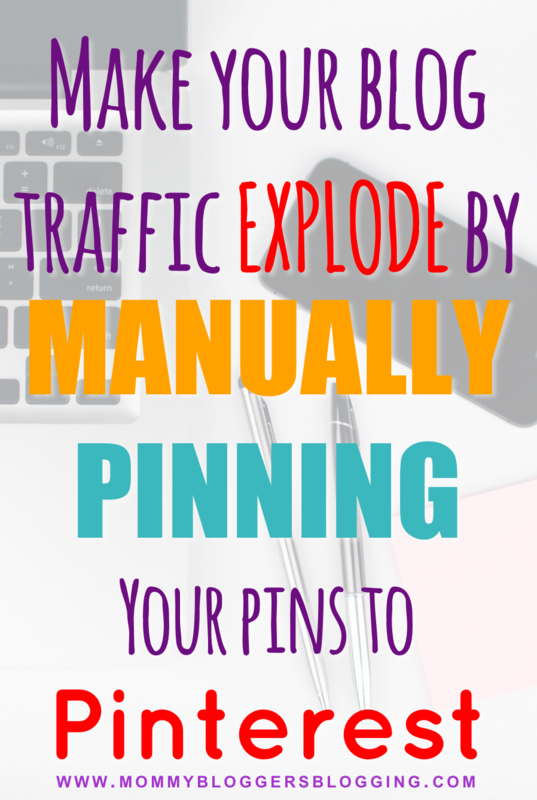 The obvious, big advantage of manually pinning your pins to Pinterest is the TRAFFIC. Traffic is vitally important to successful blogging and gaining traffic quickly is even more important for new bloggers. The biggest disadvantage to manual pinning is the time it takes. It takes a lot of time to set up the system, time to see results, and time each and ever day to pin those pins. I have started automating a very little bit because LIFE but I’m still manually pinning the pins I really want a performance boost for. It takes a lot of time to learn, set up, and continuously schedule pins too, it’s just not an everyday task. 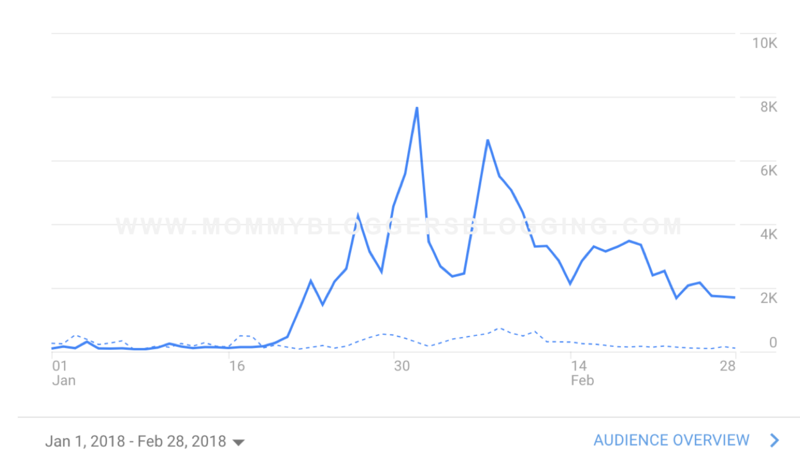 Pin consistently – you can see from my results, it is an everyday thing you have to commit to or you won’t maintain the traffic. Stay organized – I use google sheets to organize and track which pins are being pinned to which boards. Quality pins and content – You could spend all day everyday pinning but if you don’t have attractive pins and useful content, no one is going to be interested in your blog. I have one more thing I want to say about the ebook, even if you have made it through this review and you have decided manual pinning is not for you. Carly’s explanation of how Pinterest works is so clear and easy to follow. That and the section on how to find your top performing pins is more than worth the cost of this ebook. If you are at all unsure about how Pinterest works and how to use it to drive traffic to your blog, you need this ebook! Are you going to give it a try? Let me know below!